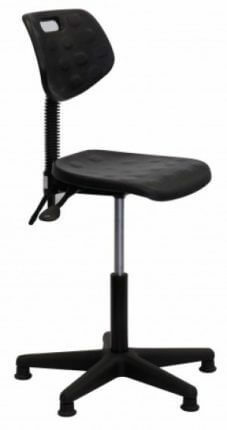 Ideal for extended sitting periods, this adjustable stool helps fight fatigue. 5-Way adjustable ergonomic stool – Ergonomic furniture that’s made to last! 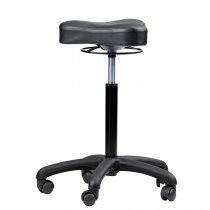 Ideal for extended sitting periods, this adjustable stool helps fight fatigue with 5 ergonomic adjustments and a contoured seat and back. 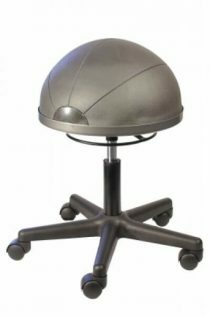 The upholstery of this swivel stool is made with puncture and wear resistant self skinned polyurethane that is easy to clean. The seat features a plate reinforcement that helps this shop chair withstand heavy duty use in tough working environments. The seat also has a waterfall edge to help blood circulation to the legs. 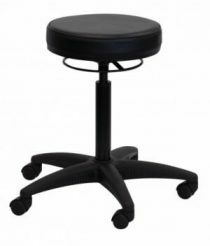 Ergonomic adjustments of this work stool include independent seat and back tilt adjustment, back height adjustment, pneumatic seat height adjustment and back depth range adjustment. table 5 blade base includes both casters for mobility and glides for stationary use. The seat is fitted with height and tilt adjustable back rest, on a sturdy 5 star base with castors or glides and optional kick ring. PU seating has the advantage of being very robust and easily cleaned, making it suitable for most industrial, lab or workshop environments. Optional Extras: Footring, 200mm or 265mm Gaslift.